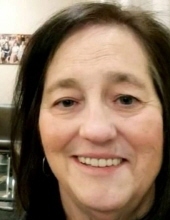 Jody Lynn Yentes, 62, of Manito passed away Tuesday, March 12, 2019 at Pekin Hospital. She was born July 9, 1956 in Pekin to Raymond and Doris Watson Yentes. Her parents; sister, Janet Yentes; brother, Larry Yentes and brother-in-law, B.J. Wills preceded her in death. She is survived by her sisters, Cathy (Jerry) Graham, Jeanie Wills, Judy (Steve Mangold) Kelly; sister-in-law, Phyllis Yentes and several nieces, nephews, great-nieces and great-nephews. Jody worked at Autumn Accolade Inc. in Green Valley. She enjoyed her work and cared for the people she served and worked with very much. She also enjoyed camping and being a prankster to her family and friends. Jody loved cooking and baking; especially her decorated cakes, mints, chocolate chip cookies, peanut clusters and brownies. She loved to share her cooking with others and enjoyed seeing the smile it put on their faces. More than anything she loved her family; especially her nieces and nephews. Jody was a loving, kind and giving person and will be greatly missed by all that knew her. Per her wishes cremation has been accorded. A combined celebration of life for Jody and her brother-in-law, B.J. will be held on Saturday, March 30, 2019 at Fergie’s Pub and Banquet Center 105 W. Market Street, Manito, IL 61546 starting at 3 p.m.
To send flowers or a remembrance gift to the family of Jody Yentes, please visit our Tribute Store. "Email Address" would like to share the life celebration of Jody Yentes. Click on the "link" to go to share a favorite memory or leave a condolence message for the family.